Here was me thinking, stupidly, that I was going to be so organised this school holiday. I was going to achieve something, finish up some projects that have been lying around for way too long. I was right on track this morning, I sewed our new living-room curtains and was just ironing the 2nd pair, thinking great, I will make some lunch, hubby will go to work. Then the boys and I can watch a movie and I can knit, cool. When there is someone yelling, water running and do I know how to turn the cold water off! The tap is broken, it won’t shut off,my hubby, the non DIY person of the family, proceeds to take apart the cold tap, tell me I need to buy THIS part and then rushes off to work! Okay, so I have really dirty hair that REALLY need the roots doing, no cold water, a dishwasher full of dirty dishes, no cold water, 3 boys who need to pee AND no cold water. Of course I know how to switch the water on but a certain person in his wisdom left the tap dismantled in the bathroom. AND its lunch time so no shops open till 2pm. So we re-build the tap, so that we don’t flood the bathroom, cause peeing and flushing are very important by this point. At 2pm I head out with 2 boys having decided to do some shopping stuff I was saving till later in the week, its sport stuff, I actually dislike shopping in the sport store, A LOT. So in the 1st store there are no climbing shoes to fit no2 son, no3 son finds the football he wants though. 1 down, in the 2nd store we really like the shoes that are almost 100euros, nope, nice try but try again, we find another pair that are sized wrong but fit, cool, 2 down, now I still need to buy the velvet ribbon and the shop is right across the road. Do you think the toads can behave for 5mins in the fabric shop, not a chance. Pushing, shoving. poking, prodding, you know its all a ploy so that I can’t look at any fabric, well it works. So now all we need to do is tackle the DIY shop, did we find the part, no,non,nup,nope,nothing, after searching, asking 2 guys, no they don’t have anything like it and they can’t help, bum! So I decided to check out the taps to see how they should work, they don’t have any evenly remotely like the ones on our sinks. So I give up, a certain someone can have a go at fixing it tomorrow, I’m done. 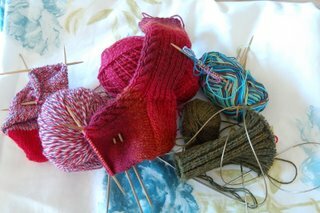 Did I do any knitting, eh no, the photo is this weekends sock progress. The rest of the week can only get better, can’t it? Dear Yvette, I found you in the Harlot’s comments and then clicked and first read “grenoble” and was about to thank you in my mind for writing in English and the next word I saw was “Scottish”, so the gratitude fizzled in a little swirl of laughter. Maybe we are all having husband problems today. Mine, the carpenter, is trying to talk me out of getting a roofer to go up 30 feet or maybe 10 or 15 meters onto the roof to fix what the wind blew off, on Saturday. I try not to think of him in terms of financial value to me – if it costs $200 it is worth getting a roofer; if it is $500, which I don’t really have to spare, is it worth it? And if he does it himself with no trouble and no danger, what does that mean????? It’s not like the porch railing, which, if (when) it falls off, we can just make everyone use the back door. When it rains, we will get water. Well, thanks for listening. Or not. Best wishes with all of yours. and the price of trainers these days … ouch! Polly,Unfortunately I have never found a reliable plumber here and as its the holidays, none of my neighbours knew of anyone who was available. Anyway as of late last night its fixed, with a hammer! Don’t ask!! !